The view from the trail-side of the falls was mediocre at best. Before heading to Iceland’s east coast, we made a quick refueling/pooling/grocery shopping/reconnaissance-finding stop in Egilstaddir, East Iceland’s largest town at a population of 2270. The very friendly woman at the tourist info showed us a tantalizing photo of Litlanesfoss, yet another beautiful Icelandic waterfall, so we decided to make a detour there even though it was about an hour out of our way. The one thing she neglected to tell us was that the photograph she showed us had been taken from a cliff on the opposite side of the canyon from where we were hiking, and it looked nothing like the obscured, far-away view we had from our side of the trail. If we had never seen that photo, we wouldn’t have known there was an alternative, but this view simply wouldn’t do; now we were on a mission. The main obstacle, of course, was the deep canyon and rushing frigid waters that separated us from the photograph we wanted. 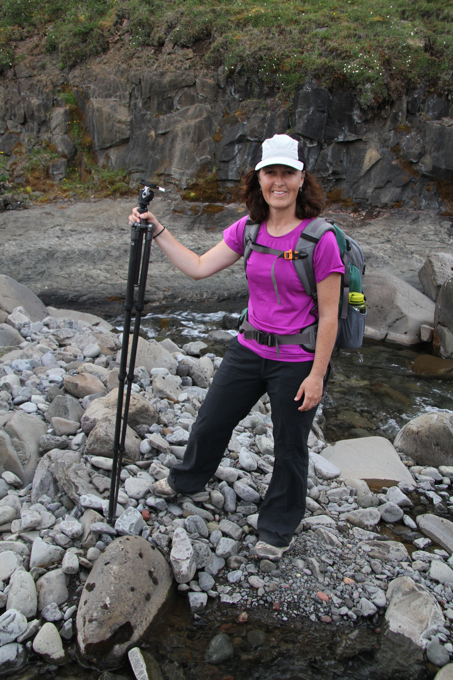 Against our better judgment, we headed off trail down into the canyon, edged along a steep and slippery bank, boulder-hopped our way across and scrambled up to the other side. Here we are at the bottom of the canyon. Too late to turn back now! Once we found the optimal vantage point we realized why the main trail did not head this way; in order to even see the waterfall, you had to perch on a precarious ledge and look straight down at the falls. Even if you were not afraid of heights, it would be almost impossible not to get a severe case of vertigo while looking through the lens. 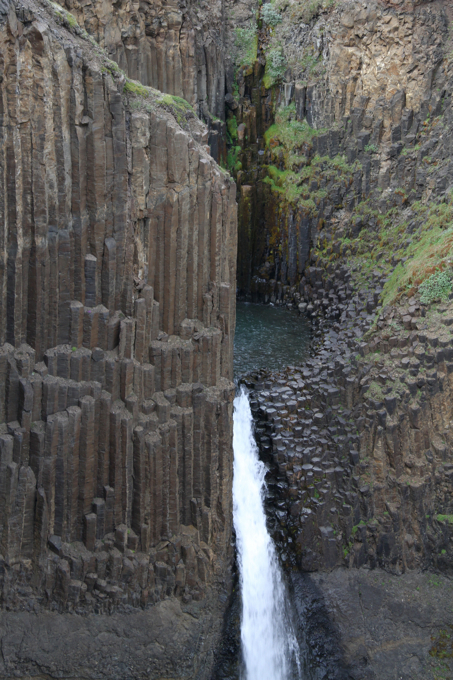 Finally, a better view of the falls and the attractive hexagonal basalt formations surrounding them. We’re not sure that the final picture was worth the effort, but it definitely made for a memorable experience! Next we headed north to Borgarfjördur Eystri, the northernmost peninsula of Iceland’s Eastfjörds. We were so captivated with the Westfjörds that quite honestly we were expecting to be a little let down by the east coast version. All fears were quickly dispelled as we climbed the treacherous mountain pass that separated us from the charming coastal town of Bakkagerdi. The snow-capped peaks looked close enough to touch, and we held our breath as we descended the steep gravel roads. What awaited us on the other side was a tiny fishing village (population 100) with mountain backdrops on three sides and a scenic harbor set right in the middle. 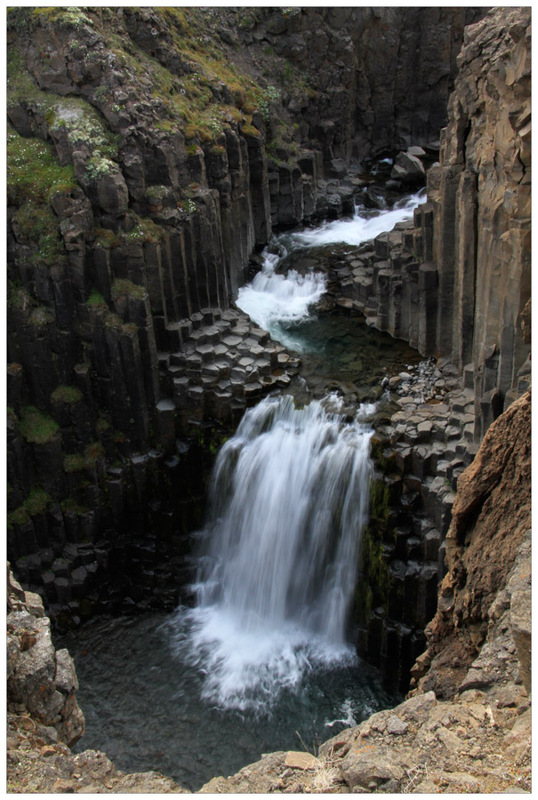 Welcome to one of the best-kept secrets in Iceland! It was an unexpected surprise to find such dramatic peaks in this area. In addition, there just happens to be a puffin colony a few kilometers further down the road where you can go any time of night or day. Here you approach the small bird cliff from ground level, which you access via a short boardwalk, providing excellent opportunities for close-up encounters with the colorful cuties. Like Látrabarg, you can shoot to your heart’s content; what more could you ask for? Because it is a bit later in the nesting season, we think that the puffins’ chicks have hatched. The babies are still deep in their burrows, so it isn’t possible to see them. You can, however, get nice shots of the proud parents bringing back tiny fish for their little ones to eat. It seems like the puffins like to stuff their beaks with as many tasty treats as possible and then stand outside their burrows showing off their catch for quite a while. We thought that was awfully considerate of them, especially since we were hoping to capture this behavior. We also tried to get some photos of the puffins flying back to their nests. This was a bit more challenging as the puffins wouldn’t tell us where they would be landing. In a team effort, Matt would provide air traffic control and shout “Incoming!” whenever he thought a puffin was likely to land in our vicinity. Puffins aren’t known to be particularly good flyers, but they sure are fast. The sheer number of blurry shots and puffins only half in the frame attest to our success rate; thank goodness for digital photography! Of course, there were other seabirds nesting at the site, too. This was our first experience seeing kittiwake chicks! 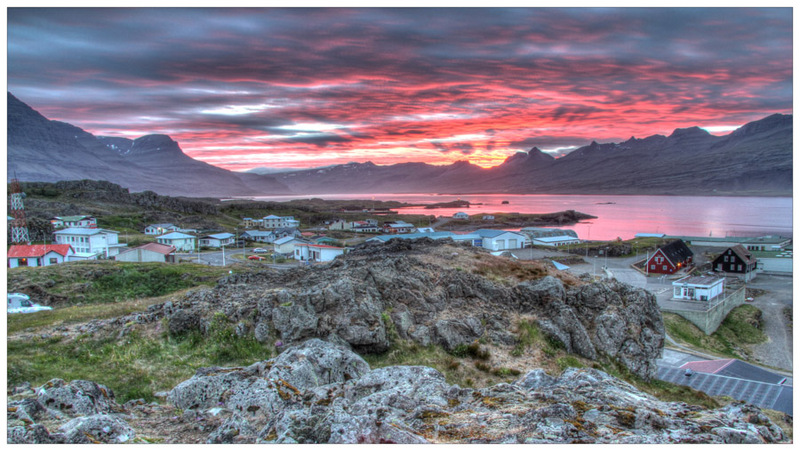 The pint-size town has special cultural significance in Iceland. Most Icelandic people believe in elves, trolls and hidden people, and Borgarfjördur Eystri is home to Álfaborg or the Elf Rock where the queen of Icelandic elves is believed to reside. We decided to grab a bite to eat at the Álfa Café (Elf Café) in her honor. Matt had traditional fish soup, while Alison enjoyed the Icelandic specialty of a waffle with cream and fruits. Delicious! The next day, we decided to tackle Stórud, one of the many beautiful hikes you can do in the area. Access was from the top of the pass on the way back out of town, and the setting was absolutely gorgeous. Unfortunately, the weather didn’t cooperate, and we had to pack up our cameras and pull out the rain gear for practically the entire hike. Although the clouds obscured most of our views, we’ve spent enough times in alpine arenas like this to imagine how beautiful the vistas would be on a more agreeable day. This moss along the trail was neon green. It was hard to believe that its color actually exists in nature. Our final destination was a stunning, verdant valley filled with enormous conglomerate boulders and small, teal blue, glacier-fed ponds. Fortunately, the rain let up as we reached this veritable Shangri-La. You have to love the Icelandic obsession with guest books, which you find in nearly every café, museum and guesthouse. No surprise, even here we found a guest book in a waterproof pouch, which we dutifully signed. You’ll just have to take our word on how gorgeous it was because the constant drizzle confined our cameras to our backpacks for most of the hike. We slowly worked our way around each slender finger of the Eastfjörds, passing through the charming coastal villages and stopping whenever the mood struck. We updated our blog at a great little café in Seydisfjördur where we couldn’t resist the mouth-watering treats coming out of the kitchen, and we particularly enjoyed photographing the old boathouses in Eskifjördur. The journey from north to south was spectacular. Jagged, green mountains resembling mighty Mayan temples loomed high over our heads, and we found waterfalls around nearly every bend. At the tip of one fjord, we stopped for a road-side picnic. Skrúdur, a small offshore island appeared white from a distance but, on closer inspection with binoculars, was actually filled with an enormous colony of gannets! Searching for a recommended waterfall, we missed a turn and headed over a mountain pass. This turned out to be a happy accident; the inland descent through Öxi into Djúpivigor, our final destination of the Eastfjörds, was spectacular. Signs warned of a 19% grade, and we felt like we were making an aerial approach in our little car as we descended the steep and windy gravel road. It was hard to keep our eyes on the road instead of on the splendid scenery, but the unintended detour turned out to be a highlight of the day. Birdlife is plentiful in Djúpivigor, and we walked the trails just outside of town, finding all the usual suspects to be well-represented. A beautiful sunset captured from the hill overlooking the campsite in Djúpivigor was the perfect ending to such a spectacular day! 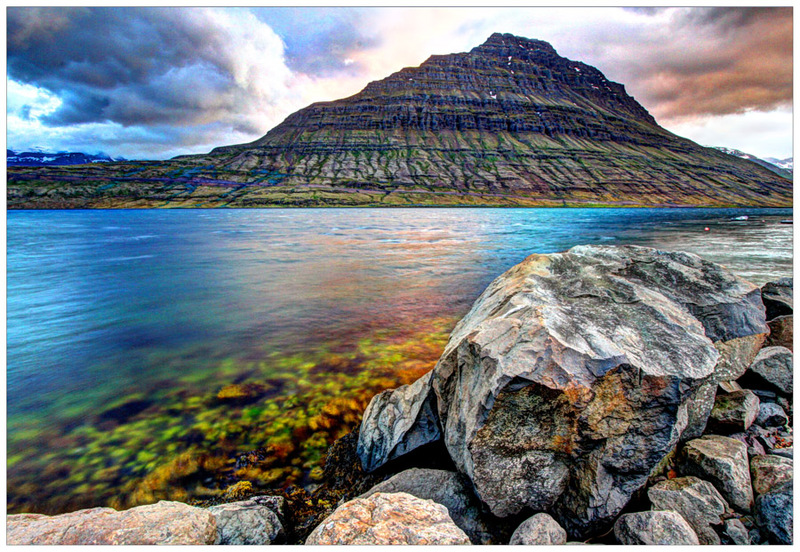 One of the main reasons to visit Djúpivigor is to take a boat ride out to Papey Island. It’s name actually means Friars Island, and it is believed to have been a hermitage for the Irish monks who first inhabited Iceland but fled once the Vikings showed up and ruined their party almost 1100 years ago. These days the island is inhabited by sea birds, and you can take a four-hour tour to see it. Our 45-minute boat ride out to Papey was a pleasure; we couldn’t have asked for nicer weather. The sea was calm, and the bright sun made it feel much warmer than it actually was. We passed jagged, rocky outcrops and saw seals sleeping lazily on their seaweed beds. Colonies of guillemots squawked at us from their crowded ledges as we drifted by. Once on shore, we were led on a guided hike to several spots along the bird cliffs where we could get close up views of Kittiwakes and their chicks. Papey is also home to a sizeable Puffin colony, but most were out at sea enjoying the beautiful day. We were two of only seven people visiting the island on our excursion, so we soaked up all the peace and solitude that Papey offered. It was a perfect ending to our time in the Eastfjörds. Puffin shot with fish in mouth is awesome. Thank you! We were really hoping to see and capture that behavior. We feel lucky to have a few good shots. These photos are amazing!!!! You’ve got such great shots of the darling puffins. Thanks, Violet! The puffins are so cute that it’s nearly impossible to take a bad shot!